This comment was posted by Matthias Röder on my post The poor quality of sound these days. It's all gloom and doom for the metropolitan opera houses right now. So what are the prospects for a live performance by a period instrument ensemble at lunchtime on Friday January 9th in sub-zero temperatures on the remote North Sea coast? No problem at all. 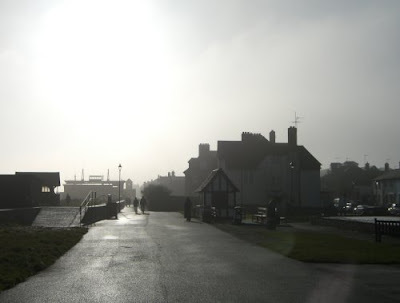 Adventurous programming means live music is alive and well in rural Suffolk, despite the freezing fog seen in my photo, which was taken in Aldeburgh at noon today. The lunch time concert by Ensemble Diderot in Aldeburgh's historic Jubilee Hall was sold out weeks ago. Ensemble Diderot comprises Johannes Pramsohler violin, Bojan Cici violin, Tomasz Pokrzywiński cello and Marc Meisel harpsichord. These young musicians are a hot property on the European chamber music scene with their refreshingly vital performances of 17th and 18th century music. They have been at Snape for a week's residency and word had got around that they are something special. And so the concert confirmed. They have the mandatory musicianship and scholarship. But they also have a certain je ne sais quoi. It is not easy to get an Aldeburgh lunchtime audience stamping their feet in appreciation, but the Ensemble Diderot did today. These guys are going places. They have provisional plans for recordings of the Leclair Sonatas Op. 4 and some lesser known music from 17th century Italy and England including CPE Bach and Gluck. But they don't yet have a recording contract. Need I say more?